On Sunday, September 18th, D.I.G. In! – Dinner In the Garden was held at Summit Community Gardens to celebrate Family Meal month. 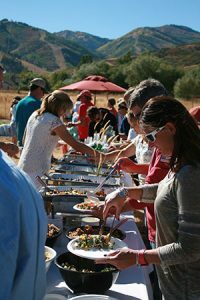 Two local nonprofits, EATS Park City and Summit Community Gardens, partnered to bring the community together to enjoy a delicious meal with fun, family activities in a beautiful garden setting. Much to our delight, the dinner sold out a week ahead, with over 300 people attending. This turnout was a true testament to the community support within Park City for an event that is designed to bring families and community together in a casual, laid-back environment where people can enjoy locally grown food, listen to music, say hi to old friends and make new ones. Not only was this event the result of a partnership between two nonprofits, the food was provided by a joint effort between the Deer Valley Resorts and Park City Mountain culinary teams – a true, unique collaboration that created a tasty menu from expert culinary minds. And it doesn’t stop there. The family activities, such as herb pot planting and an interactive garden display, were provided by other like-minded organizations, including the Summit County Health Department and Swaner EcoCenter. Two friendly goats, Fiona and Shrek, were the highlight with the kids, as well as face painting and music. The simple message of families and people getting together to share a meal is so important in this fast-paced life we live – and it was thoroughly embraced by the Park City community last week. The message of the importance of the Family Meal was subtly woven into our table décor to help spread the word: studies show families who eat together have children with less emotional problems, less drug use, better nutrition and better grades. The timing was important. And, check out photos on Facebook to get a great feel for the day!